The dictionary definition of a bird's-eye view is “an elevated view of an object from above, with a perspective as though the observer was a bird” but what do birds actually see? From the importance of colour in birds plumage, birds certainly see colour. From the large size of eyes relative to brain, vision is an important sense for birds. What birds see to a large extent is influenced by the position of the eyes. Typical birds like Blackbird and Robin have some forward view, excellent lateral view but like us no vision behind. Interestingly, birds like these cannot see the tip of their bill but obviously have enough binocular vision to be able to feed their young. Birds like Woodcock and ducks with eyes high up on the sides of the head, while they do not have a great forward view, do have an all round view including above and behind. While this is ideal for detecting potential predators, they are probably seeing two separate images one from each eye. Finally, there are the birds like raptors with forward facing eyes. This binocular vision giving slightly different images from the right and left eye, enables the brain to determine the distance to the object and is ideal for hunting. While humans share the raptor’s binocular vision, it is estimated that the raptor’s visual acuity is more than twice as good as our own. In our eyes there is an area called the fovea where the light detecting rods and cones are most concentrated and the vision is sharpest. 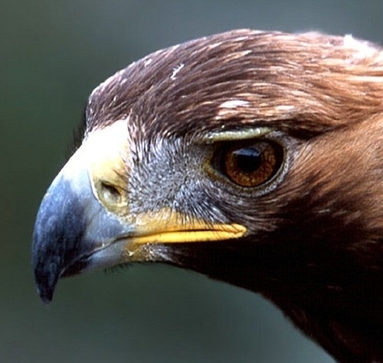 Raptors have two foveas in each eye. In the raptor fovea there are about one million cones per square millimetre compared with 200,000 in humans. Around half of all bird species have two foveas. Another unique structure in a bird's eye is the pecten. Pecten is a thin, greatly folded tissue in the eye. Predatory birds such as eagles and hawks have the largest and most elaborate pecten of all the birds. The pecten supplies nutrients and oxygen throughout the liquid of the eye, thereby reducing the number of blood vessels on the retina at the back of the eye. With fewer blood vessels to scatter light coming into the eye, raptor vision has evolved to be the sharpest vision known among all organisms. Finally a word on the “third eyelid”, the nictitating membrane, that transparent inner eyelid found in birds, reptiles, and some mammals. Its purpose is to protect and moisten the eye. It is quickly drawn across the eye. Sometimes it can be seen when birds like pigeons peck among vegetation. The membrane moves across to protect the eye from spiky leaves. Similarly, just before a plunging Gannet hits the water, the membrane moves across. Our nictitating membrane? A remnant…the wee pink blob in the corner of your eye.